I’m 39. There! I said it. So when “skinny ties” made a comeback, I bought one and ya know what? I felt silly. I felt like an old guy trying to dress like a young guy. It wasn’t working so it was the first and last “skinny tie” I owned. But I’ve broken it out for ’44 Days of Ties’. 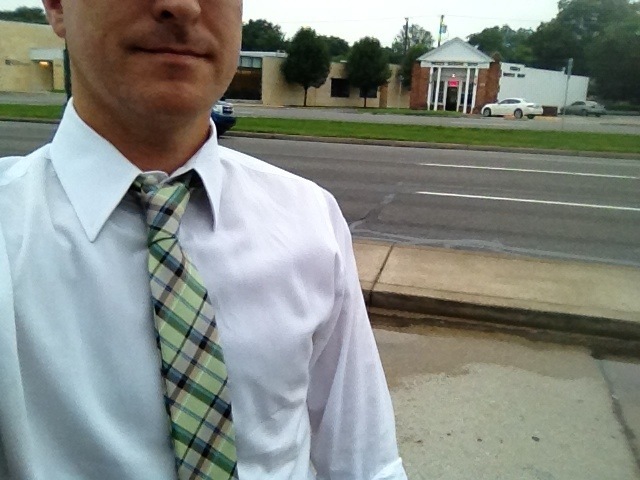 You won’t be surprised that today’s shirt and tie, again, are from Express. This tie has pastel tones of pink, aqua, blue, and green and I call it my “Easter Tie” because it looks like colors you might paint Easter Eggs. Since it’s a “skinny tie” which makes me an “aging hipster” for even wearing it, I went full-on hipster today dressing in clothing 1-size too small for me. That’s a total hipster move. If I was 15 pounds lighter, my J. Crew pinstripe grey chinos and my Express 1MX Fitted dress shirt would look great. But, like any good hipster knows, dressing in clothes just slightly too small for your body and weight is a good look. It’s grey and rainy on Woodward, today, so not many classic cars are out like they usually are on a nice, sunny morning the week of the Woodward Dream Cruise. I waited and waited to try and snap a tie picture with a classic car cruising by, but no luck. So instead you get to see Fred’s Barber Shop which looks like it’s been there forever. I give Fred credit for staying in business …Woodward, just south of Birmingham, is a high rent district, so a cash business selling haircuts for $15 (I’m guessing) must be hanging onto the business by its fingernails (I’m also guessing on that, I have no idea how good or bad his haircut business does). I’ve never been in there. As I’ve mentioned, I frequent The Barber Pole in downtown Birmingham and this months haircut is scheduled for Thursday. What tie should I wear for the occasion of a fresh haircut? So much to think about.